The situation for the Kurds today is reminiscent of the times of the Sykes-Picot agreement and the Sever and Lausanne treaties at the beginning of the last century. As in all exceptional moments in the history of the region, there is much talk about the nature of the Kurds’ belonging to the countries where they live, and whether they have separatist projects. In the Syrian case, for example, the question that arises is whether the Kurds in Syria are Syrians or Kurds. This question is also common in Iraq, Turkey, and Iran. The Kurdish issue and how to deal with it is what brings together these four countries, despite the political, ethnic, and ideological differences among them. In the case of Iraqi Kurdistan, the four countries agreed to reject the referendum held late last year, preventing the establishment of a Kurdish state by regaining the control of Iraqi forces together with the Iranian-backed Popular Mobilisation Forces (PMF) over the oil-rich city of Kirkuk and all other so-called disputed areas between the Iraqi government and the Kurdistan Regional Government (KRG). The Democratic Society Movement (TEV-DEM) is one of the most important Kurdish entities in Syria. It includes military, security, social and political organizations, among which are the Democratic Union Party (PYD), considered the most effective in the Syrian Kurdish political scene, and the “People’s Protection Units” (YPG), the major pillar of Syria’s democratic forces (SDF). The Democratic Society Movement is an intellectual extension of the (Turkish) Kurdistan Workers’ Party (PKK) in Syria and its leader Abdullah Ocalan, who has been imprisoned on the Turkish island of Imrali since 1999. In Syria, it attempts to decentralize the future government of Syria, starting with the self-administration declaration in early 2014 and followed by the Community Federation, in partnership with many local components, in the provinces of Al-Jazeera, Al-Furat, and Afrin. It seeks to do so to gradually reduce the authority of the Syrian government in areas of control. 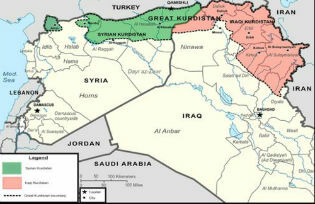 The other Kurdish political entity in Syria, apart from PYD, is led by the Kurdish National Council (KNC) in Syria (an alliance that was established in 2011 and includes several Kurdish parties in Syria), namely the Kurdistan Democratic Party – Syria, which receives support from the Kurdistan Regional Government. “The Council” has a military force, “Peshmerga Roj Ava”, which was trained by the Kurdistan region of Iraq and participated in the battles of Mosul against the so-called Islamic State (IS). However, the Syrian government allied itself with TEV-DEM at the beginning of the Syrian war in 2011, allowing it to establish a military force (the People’s Protection Units) and a security one (Asayish) in order to share some influence in areas of Kurdish majority. Since the Battle of Kobani (Ain al-Arab) in 2014, TEV-DEM has expanded its control all over the area, becoming an ally of the US-led coalition, as SDF. It achieved major victories against IS in Manbij, Al-Raqqa, Tal Abyad, and part of Deir Al-Zour, to fully control the entire eastern Euphrates, which is considered today as the American area of influence, facing the control of the Syrian army and its allies on the west Euphrates. However, the Syrian government observes that its Kurdish “ally” is – gradually – establishing a semi-independent entity whose ambition may end in independence. The differences between the two rival parties led to clashes between the Syrian army and the People’s Protection Units in both the cities of Al-Qamishli and Al-Hasakah, where the Syrian government used the airforce for the first time. This incident indicated the depth of the dispute between them. Consequently, it led to the recent “alliance of necessity” between the Syrian and Turkish governments in a joint effort – sponsored by Russia and Iran – to prevent a Kurdish region on the border between the two countries. Following its ambitions of a new Middle East with secular slogans and a Muslim Brotherhoods’ modernist character, the Turkish government of President Recep Tayyip Erdoğan became looked inwards and was focused on facing the Kurdish threat of the Federation of Northern Syria, led by political groups affiliated with the Kurdistan Workers’ Party (PKK), the primary enemy of Turkey since the eighties of the last century. Also, SDF’s alliance with the U.S increased the fear of a divisive project with the Kurds acting as its warhead, which threatens Turkey’s national security. Therefore, the Turkish forces, in cooperation with their Syrian opposition allies, entered the areas of Jarablus and Al-Bab last year in an effort to separate the two provinces of Kobani and Afrin, in addition to their current direct intervention in Afrin to prevent SDF’s access to a seaport which would create a viable entity. Like the Syrian government, Iran tactically allied itself with the PYD and its armed wing, YPG in the early days of the Syrian crisis. This alliance gradually shrank after the battles to regain control over the city of Kobani / Ayn Al-Arab. Along with the Syrian government, Iran refrained from supporting the YPG to recover the town, which allowed the latter to ally with the U.S. Surely, Iran, which participated with its full force in the Syrian war, will not accept a government hostile towards it, and close to Washington. Subsequently, the latter’s interest is to observe the Iraqi – Syrian border to prevent Tehran from reaching the Mediterranean, passing through Damascus and the southern suburb of Beirut (the main stronghold of the Lebanese Hezbollah). In this case, SDF is the best ally. However, it is difficult for the latter to do this task considering the strong relationship between the PKK and Iran, as well as the “PKK’s” hostility toward Turkey. The declared federal project faces a remarkable common rejection by the conflicting parties in Syria, and for contradictory reasons. It is only a few times that the Syrian government and the opposition platforms of Riyadh, Moscow, and Cairo hold the same position. This project also faces rejection by the KNC. Both the Syrian government and the opposition platforms accuse the “project” of being one of separation and consider it a partition plan sponsored by the US. In contrast, the KNC describes it as a far cry from the Kurdish national dream and accuses its directors, especially the TEV-DEM, of not having a Kurdish national project but only a utopian one. I believe that the fate of such a project is linked to the regional and international agreements regarding the Syrian crisis. In other words, since both, the United States and its allies on the one hand and the Russian Federation and its allies, on the other hand, lead the world and share the region’s dossiers, the Kurdish dossier, therefore, is up for international agreements. Finally, in such major crises we might either see a Kurdish region with international blessings or there will be another treaty to replace Lausanne, but under different conditions. Alan Hasan is a Syrian writer.